Metal Gates, Iron Fences, and railings at affordable prices. Transform your Sacramento Home or Office with Irish Iron. We’re the best Sacramento Ironworks company around. Handcrafted Ornamental Iron. Irish Iron takes pride in providing you with unique, custom made metal gates, custom iron driveway gates, metal fences, and much more. Each project is crafted with old world techniques and new age technology in hinge design and installation to ensure your iron gates and iron fencing withstands the test of time. If you have an idea for a custom design give us a call and we will make your idea come to life. There are many ideas on this website of other projects that we have done if you will please visit Our Gallery, here you will be able to see 100's of projects that we have worked on over the years. From iron fencing to wrought iron gates. Take a look and get some ideas for your own project, make notes of what you like. If you are looking for a special design for a walkway gate, an inside railing or a pool fence to protect your children and pets we have the expertise to make your drawings come to life. Looking for custom made iron security gates or custom metal fences? Why Custom Iron Fencing and Custom Made Metal Gates in Sacramento? There are many wonderful reasons for considering Wrought Iron or Ornamental Iron for your Sacramento or Carmichael home. Irish Iron can help you install a new backyard gate for your Sacramento home, a pool fence for your Carmichael garden, or deck railing for your Sacramento backyard. What can be made with our handcrafted iron? Anything! We work on all kinds of residential and commercial projects, home owners may want a small specialty gate into a garden, a pool safety fence or an iron entry gate for the garage or doors. Apartment complexes and condo projects often need iron railings or stair well hand rails. Office complex may need interior iron railings, stairwell hand rails and wrought iron benches. Whatever the size of your project we offer free estimate and lots of references. Call Bill at 916-269-0882. We have lots of pictures of some of the custom homes that we have worked on in and around the greater Sacramento metro area. Irish Iron Serving Roseville CA, Folsom CA, Elk Grove CA, El Dorado Hills CA, Arden-Arcade CA, Citrus Heights CA, and Rancho Cordova CA. 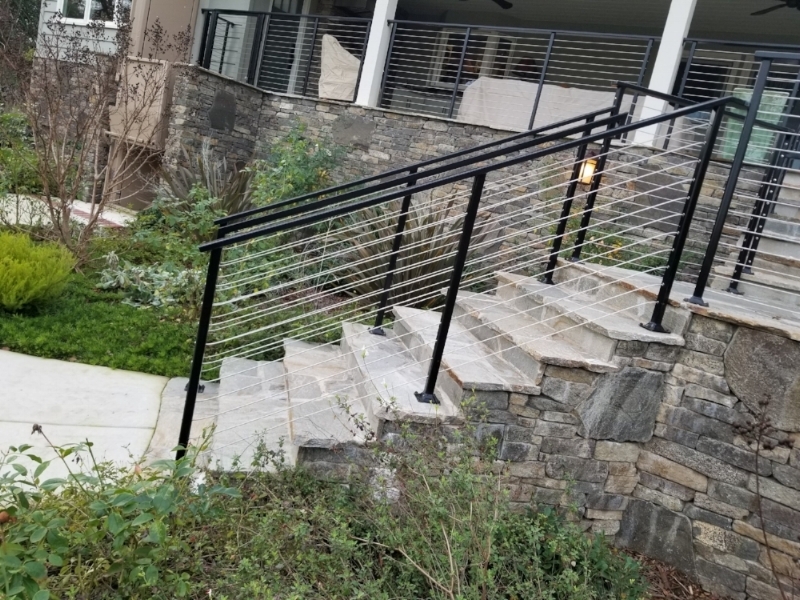 Custom Iron Gates Sacramento, Stair Railings, Pool Fencing, Hand Rails, Spiral Iron Stairs, Wrought Iron Benches, Driveway Gates, Wrought Iron Fencing, Custom Designs, Iron Porch Railings. Irish Iron 8210 Fair Oaks Blvd Carmichael, CA 95608 Sacramento Wrought Iron 916-269-0882 Free Estimate.